As an Orange County homeowner, you want to be able to take care of your property, in the best manner possible. One fixture that requires both service and care is your water heater. Whether making it a point to get it serviced or finally getting it replaced, it will remain an ongoing project. However, what many locals want to know is how they can tell if they need just repairs or if it is truly time for replacement. The reason this is such a big concern is that one too many less than scrupulous contractors out there will claim you need replacement when all you really need is repairs. By making sure that you are an informed homeowner and consumer, you can help to reduce the likelihood of that happening. Sure, this may not be your area of expertise, but you can still be in the know. Let's look at some signs that mean you need a new water heater, or some factors to consider so you can make the best choice. How old is your current water heater? The average age is 12-15 years. So if you are already nearing that milestone, it may make more sense to invest in a new system than keep paying to repair the old. On the other hand, if you are well below that time frame, you should certainly get a second opinion before agreeing to a new system. If you notice that your water heater has sprung a leak, it is time for a new water heater. There is no such thing as a minor or repairable leak for a water heater. Once you see water spilling from the tank, the system needs to be replaced. If repairs are an option, how costly are they? The general guideline for repairs versus replacement on any type of system is to compare the current value to the repair costs. If the repair cost for your water heater is 50% or more than the current value, it is time to opt for replacement instead. Consider the size of your family and/or the amount of use. Obviously, water heaters that are used more frequently are overly taxed. This often results in shortening the life expectancy of a water heater. This extra strain makes it difficult for your system to keep up. How often are you getting repairs done? Even if your water heater is not that old, it may be in constant need of repairs. If this is the case, replacement would be the more rational, cost-effective alternative to continuing to call on a plumber for professional repair services. You also are likely to notice signs of your older tank breaking down. For example, if you observe a metallic smell or taste, it is likely the result of your old tank beginning to deteriorate. You may even see flakes of metal or grit present in the water, actual pieces of the tank, which are not good signs. Of course, the best way to avoid being duped and make sure you only get honest feedback is by making it a point to only work with a reputable HVAC company. Ask around and local here will tell you that name is Perfect Comfort. Perfect Comfort is the local leading service provider for a number of vital services, including water heaters. We take great pride in the fact that we are able to help so many locals get the service that they need, and nothing more. There is no reason to talk customers into work that they don't need, just to make an extra buck. Our commitment is to the customer experience which should result in customer satisfaction, each and every time. There is no reason to settle for less than the best, including the customer care you receive. Contact us now to find out more about what we can do for you. 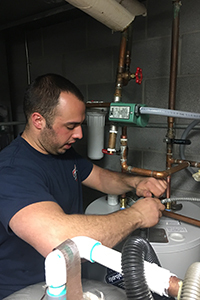 If you are looking for a Orange County NY & Hudson Valley, NY Water Heaters Contractor please call us at (845) 497-1005 or complete our online request form.